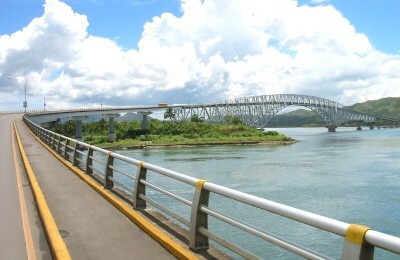 The longest bridge in Southeast Asia, San Juanico Bridge, is known as a symbol of love by the Waraynons which connects the sister islands of Samar and Leyte. Samar province has her share of nature’s bounty. Among the nature’s jewels which enchantingly lure tourists and local folks includes unexplored mountains and caves which are inhabited by exotic wildlife, pristine shores rimmed by unspoiled coral reefs, cloud-hidden lakes of blue surrounded by multi-colored flowers and beautiful beaches and waterfalls nestled beside a mountain. Here are some of Samar’s beautiful spots. The park is situated at Rawis, Brgy. Guirang, Basey, Samar covering an approximate area of 840 hectares. Fascinating geological features abound in the area of the national park such as caves, hugs, limestone boulders, rockholes, weathered formation rocks and underground rivers. The most prominent assemblage in the park is the cathedral-like caves, which are the Panhulugan I, and II, Sohoton and Bugosan. All the caves in the park are endogen caves in angular limestone cliff, which support the base of other crack system. It abounds with flowstones and dripstones. Two and a half (2½) hours motorboat ride from Tacloban City and two (2) hours ride from Basey proper can reach these tourist spots in Basey. A fantastic huge arch-shaped rock that connects two mountains ridges spanning the Sohoton River. It has a vertical clearance of 23 feet, about 8 meters in width and 40 meters in length. The Stone Bridge is forested at its upper portion while on its underside hang heavy karst formations of giant stalactites forming like swords and rockets. This is located within the Sohoton National Park in Basey. This cave frames itself in an angular limestone cliff forming a letter “H” where its three (3) main cracks serve to wit its form, its two (2) parallel legs lying 50 meters apart and connected at the entrance by a perpendicular crosspiece. The cracks serve to be the hub opening for internal hallways. All portions of this cave are geologically active as evidenced by the constant drips of water from stalactites. The internal cave chambers measured some 49.2 feet high at the end of its leg. Its cathedral immensity contains a mismaze interior that branch out into many multi-leveled chambers and tunnels with an infinite variety of flowstones and rock formations resembling some familiar images of the outside world ranging from miniature of famous tourist spots. It is located within the Sohoton National Park in Basey. The Panhulugan Caves was used as burial disposition during the 13th century. The cave resembles a scar formed by a rock shelter around 164 feet (50 meters) in length and 16.4 feet (5 meters) in height. It is also topographically divided into four parts: Areas, A, B, C and D. Snow-white glittering stalactites of various symmetry hang from the cave’s ceiling, while the brownish to grayish stalagmites seem to grow endless on the cave’s floor. Also located within the Sohoton National Park in Basey. 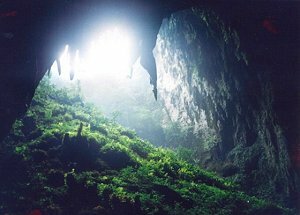 The Sohoton cave is a cathedral-like dome with an entrance of a parabolic arch-type for about fifty-meters high. It has a flat door area near the entrance, about twenty (20) meters in width and fifty-meters in length. On its ceiling hangs spike-shaped crystalline stalactites and rustic and cavernous walls and stalagmites on the cave’s floor. At the far end of the cave are a prince-like window and a balcony overlooking the natural swimming pool below. Also located within the Sohoton National Park. Panhulugan Cliff is a high and steep rock formation directly across Panhulugan Cave I. Down this towering cliff is a narrow curve of the Sohoton River wherein passing bancas are dragged during low tide. The name Panhulugan is from the waray-waray word “hulug” which means to drop from atop. Filipino rebels had used this cliff as an ambush area during the Filipino-American war. Also located within the Sohoton National Park. 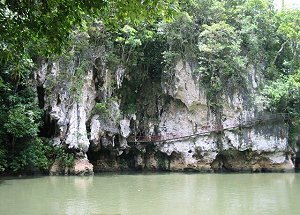 Found also within the Sohoton National Park are the Bugasan and Kapigtan Caves. These are smaller caves compared to Sohoton and Panhulugan caves. The only difference of these caves of the that to Sohoton is the presence of concavities where ancient remains had been found dating to the Stone and Iron Age period. This is a landmark of the 15th century church found in the mountain of Barangay Dapdap, Tarangnan, Samar. 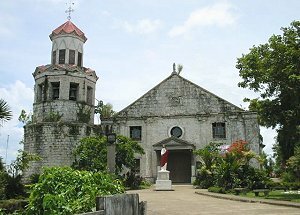 This was also called “Tinago Church”, being a hideout of Spanish missionaries. The church stands as a historical landmark of Basey. Bangon Falls is one of the most beautiful and spectacular scenic spots worth visiting in the province. From Brgy. San Jaoquin, Tinambacan district, where Lologayan Falls is located; it will take an additional 20 minutes ride to reach Brgy. Tinaplacan and another 30 minutes walk to the vicinity of the falls. Following the stream by ascending to the upper level, one will be amazed to see a circular pond of about 30 meters in diameter, wide enough for swimming and deep enough for diving. The water that falls from above seems to come from an endless stream which flows a swirling path around the falls resulting from the pressure of its disgorge becoming even bigger in volume and noticeable as the time of the day passes. It is not only a tourist spot but also a potential source of power to serve the city of Calbayog and its neighboring localities. Stretching about 200 meters long of grayish sand and cold blue waters with towering rocks at its south and three (3) beachfront balconied cottages. The resort gives a south sea island touch and is frequently visited by metropolitan VIPs, movie stars and foreign dignitaries. It is one of the most beautiful beaches of Samar Island located in Brgy. Malajog, Tinambacan district of Calbayog City. This beach resort is most often visited due to the accessibility of the place. It can be reached by a 30-minute ride from Calbayog City and 10 minutes from Tinambacan District. Its white sand, blue waters, swaying palm trees, towering rocks and concrete rest houses give the spot a "South Seas Island" touch. What is most inviting is the cool water, which is different from other beach resorts. This cave is situated at the edge of Brgy. Longsod, Oquendo district of Calbayog City. The cave has been the main attraction for picnickers desiring to get the rare thrill and excitement of having a trip through nature-made dark tunnels. The cave made a name for itself when it was made a hideout by two men wanted by the guerrillas who hid in it for nearly two years and coming out at night in search for food. Hence, the name “Tinago-an” means hiding place. Mawacat Slide is an hour ride from the Calbayog City proper to Brgy. Mawacat, Oquendo district and a 20-minute walk thereafter along a foot trail, shaded by lined tall trees. It is a natural spoon-like formation, which inclined more or less by about 45 degrees and stretching a length of about 50 meters. Water flows along this giant cistern and from the top, one can slide through the mossy lane to the cool inviting pool below. A bathing resort mostly favored by Samareños, which is found at Brgy. Blanca Aurora, municipality of San Jorge. Pan-as Falls is located at Brgy. Pilar, Oquendo district and is surrounded with the mighty stands of rare timbers and wildlife that abound in the area. An hour drive from the Calbayog City proper and a 30-minute hike from the village can easily visit the place. Seen from afar, it is like a long constructed boat by the mountainside and at a close up, a series of long drop of crystal water to another. At places where the cataract is quite high, the falling of water into the pool below becomes a mere mist because of its high elevation. It is the source of water supply of the city populace. The scenic view of the waterfall is vividly illustrated through the boulders that rise and water falls in a series of cataract-like steps from down below to the topmost section of the mountain. Nature has placed it within easy reach to compensate and preserve its beauty. Located in Brgy. Sigo, Oquendo district the place can be reached by a 40- minute drive from the Calbayog City proper. The Mini-Hydro Electric Power Plant is also located here. A series of towering altars of rugged stones wherein between its depression, flow the ribbon-like cool water which according to old folks, cleansed the hair of a legendary lady. The term “lologayan” came from the waray-waray root word “logay” meaning to unfold a braided long hair. Thus, this term probably came from a legend of a maiden who frequently visited the place to rinse her long hair. To the site is an hour ride from the Calbayog City proper to Brgy. San Jaoquin, Tinambacan district and a 10-minute hike onward. This falls is also a source of potable water for San Jaoquin folks. As the name suggests, “mapaso” (literally means hot) is a hot spring with the consistency of boiling water. Nature has given its life in the form of fresh crustaceans (pokot) with a tainted pink-red appearance, which ordinarily resembles the tint of a scalded shrimp. This is located at Brgy. Rizal II, Oquendo District, Calbayog City. This falls is situated in Calbayog City. It is famous for its seven-layered falls and it is a good source for hydro electric power. 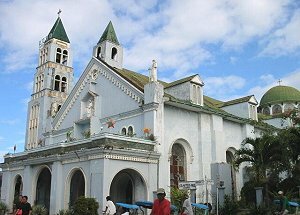 Saints Peter and Paul Cathedral that is considered to be the biggest church in all parishes in the province, seems to have lost its Spanish touch. Nevertheless, the old dome, the spire and the thick walls reveal the blending of two architectural worlds: the old and the new historical innovations. Traces of centuries old architecture could hardly be discerned. Multi-colored walls, niches, domed ceilings, blocks and tiles are, however, traces of Spanish culture. The unexplored Danao Cave is situated at Brgy. Danao I, Tinambacan district, some 114 kilometers towards the western coast of the city of Calbayog. It is made up of seven (7) chambers inhabited by various species of snakes and bats as evidenced by a good deposit of guano. The cave serves as an initiating hive for those who want to acquire talisman. Situated at the fringes of Brgy. Longsob, Oquendo District, the cave is very proximate to Mapaso Hot Spring and is almost equidistant from the Calbayog City proper. Its cathedral door size entrance leads one to wade fresh, cool water into a natural tunnel stretching through, uneven ceiling with some portions touching one’s head, giving the adventurer an eerie trip through the dark cave which can be explored by carrying lighted torches. The first ever to be established in the province of Samar, this museum is one of the vital contributions of Christ the King College in preserving the rich cultural heritage of the Filipino people. A collection of many artifacts gathered from all points of Samar Island, the museum also houses ancient coins, jars, Chinawares, bracelets and beads that date back to as early as the 14th century. The place can easily be visited at Christ the King College within the Calbayog City proper. This is another large cave full of stalactites and stalagmites, which is situated at Brgy. Mallorga, Talalora, Samar. It can be reach by one and a half-hour motorboat ride from Catbalogan. The Obelisk features the major historical events of the province which is depicted in the four sides of the structure: the arrival of the 1st Jesuit Missionaries on October 15, 1596; Rebellion of Agustin Sumoroy in 1649; Decree of Queen Isabella on August 11, 1841 declaring Samar as an independent province no longer under the jurisdiction of Cebu nor Leyte; and, the Samareños Victims of Balangiga Massacre on September 29, 1901. This historical landmark is situated in front of the Capitol Building, Catbalogan, Samar. The spring is about 40 minutes ride from Catbalogan by land and is located at Brgy. Patag, Paranas, Samar. It is a refreshing hideout from the maddening crowd which city and urban dwellers find alluring. Ruin of Bangahon is a historical landmark near the right fork of Gandara River. It was once a town during the revolutionary period, but was abandoned by the old residents who later found the present town of Gandara. One of the popular bridges nationwide known as “San Juanico Bridge” has the distinction of being not only the longest bridge in the Philippines but also the longest in Southeast Aisa. It has a total length of 2.162 kilometers or 2,162 linear meters, the equivalent of 7,092 feet and having a breadth of 10.62 meters. The highest point at the main span is 41 meters above the water level. It has 43 spans and 42 piers. The S-shaped structure on the Samar side had to be adopted to make use of the importance of the existing islet, the Cabalauan islet that lies in the middle of the San Juanico Strait between the two island provinces of Samar and Leyte. This islet serves as resting point and provides added support to the massive structure soaring over the swift currents of the strait. Nature-lovers likewise enjoy white water rafting (rapids shooting) a very challenging aqua sports at the Lulugayan falls and Rapids of Calbiga, Samar. 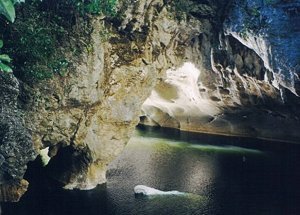 Spelunkers will surely enjoy exploring the Langun-Gobingob caves of Calbiga, Samar, said to be the 2nd largest Karst cave in the world. One of the scenic natural attractions located in the municipality of Marabut, Samar. Marabut marine park boasts its 15 towering rock islands with secluded beach coves and coral gardens, perfect for snorkeling, scuba-diving, sun bathing and other water sports activities. Accommodation can be provided to tourists coming to Catbalogan, or Calbayog City. Air-conditioned or non-air-conditioned rooms are available in these establishments.